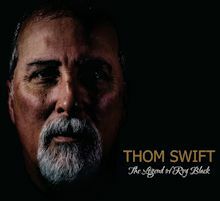 “With fresh, rootsy riffs and mature, honest stories of life, love, and family, Thom Swift is an artist taking the time to look deep into himself and recognize what truly matters. This is an artist who can do so many things with a guitar, but considerate listeners will hear elements of swampy blues, heartland folk, and Springsteenian roots-rock pulsing throughout the album. It’s an important step forward for one of the Maritimes’ best artists.” – Adam Bowie, columnist with The Daily Gleaner, juror for the Polaris Music Prize.